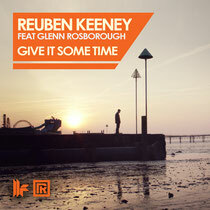 Toolroom Records latest release is ‘Give It Some Time’ and comes courtesy of Reuben Keeney and vocalist Glenn Rosborough, with a remix package that includes Kim Fai, Morgan Page and NDKJ. Reuben Keeney established himself as a real 'one to watch' at only 16, following support from David Guetta, Mark Knight, Pete Tong and Carl Cox, as well as picking up numerous accolades including 'Best New Artist' in the Irish Dance Awards. Combine Reuben’s production prowess with the vocal licks of Glenn Rosborough and ‘Give It Some Time’ is a good dance / pop fusion, an emotive piece with an infectious vocal resounding above delicate piano melodies and twinkling keys for a blissful track that could possibly be taking over the dance floors and airwaves for a long time to come. The UK’s Kim Fai provides the big hands-in-the-air moments with a thumping, main room mix, whilst US DJ/producer Morgan Page strips the original back for a more progressive affair, whilst NDKJ takes his mix down the darker route on a real techy tip. Out 21st May, you can check the video out below.